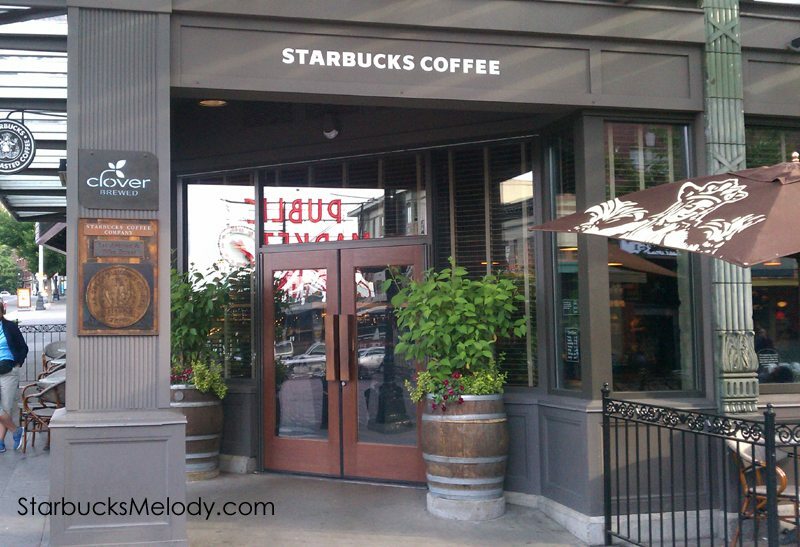 On March 13, 2009, Starbucks opened the gorgeous beacon Starbucks at the corner of First and Pike* Street, at the entrance to the Pike Place Market. I still remember walking in that first day when it was brand new and taking it all in. 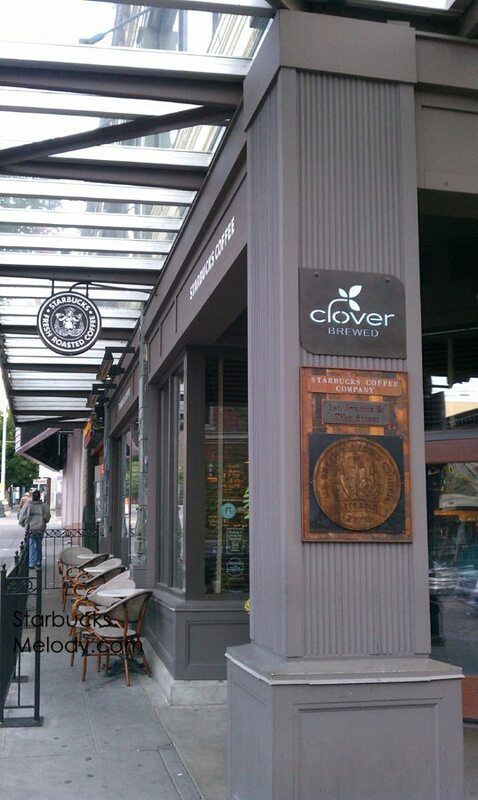 This Starbucks was the first in the new “heritage” design style, and one of the company’s first stores to be LEED Certified, and it was the first Starbucks to get two Clover brewers. 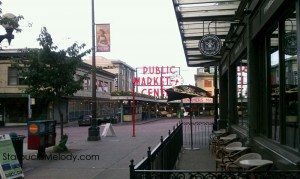 This morning I got up early and walked down the hill to the First and Pike Starbucks. 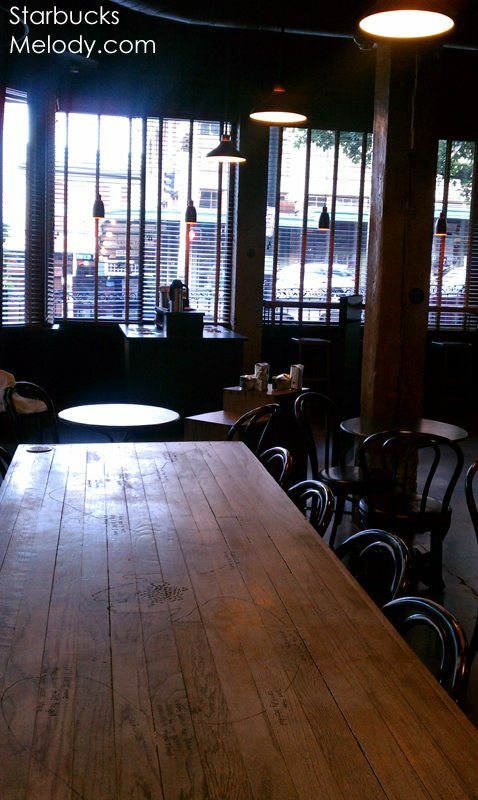 It was roughly about 6:45 a.m. when I arrived, and the store was still stunningly quiet. The store was so quiet at that hour that I immediately began to take photos of the near empty store. 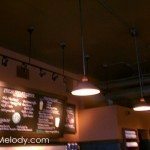 In fact, I had wanted to drop by and take a close look at the lighting fixtures because it relates to a future blog post that I am working on. I used my phone to take the pics, and not my camera because I wasn’t initially planning a blog article. 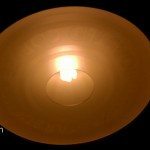 (My apologies if they look low quality). 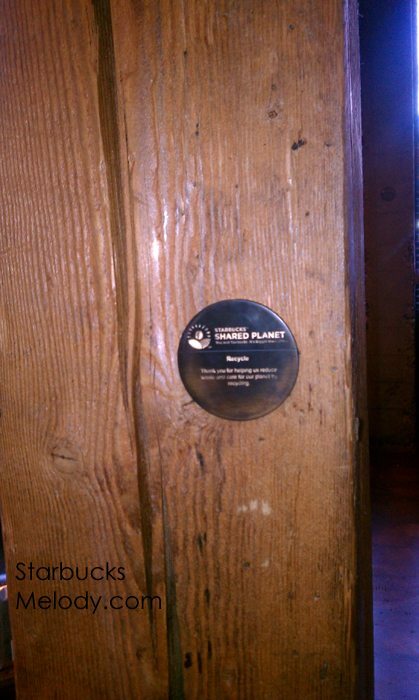 Once inside the store, there are small, round, signet-style plaques describing attributes and features of the store that helped lead to its LEED certification. 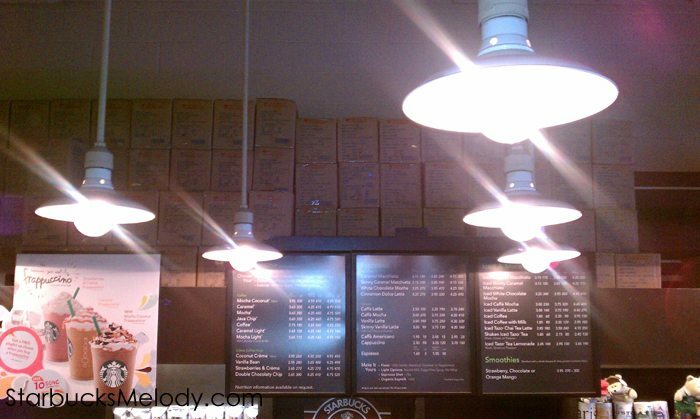 The lights inside the store are about the same shape, and similar style as those found in the first Starbucks (located a few blocks away at 1912 Pike Place). 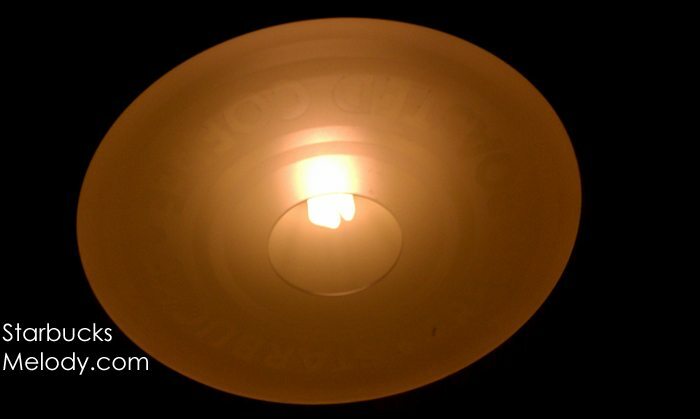 I have heard that these lights are meant to echo the original store’s lighting, and be reminiscent of that store; however there are a couple of huge differences. 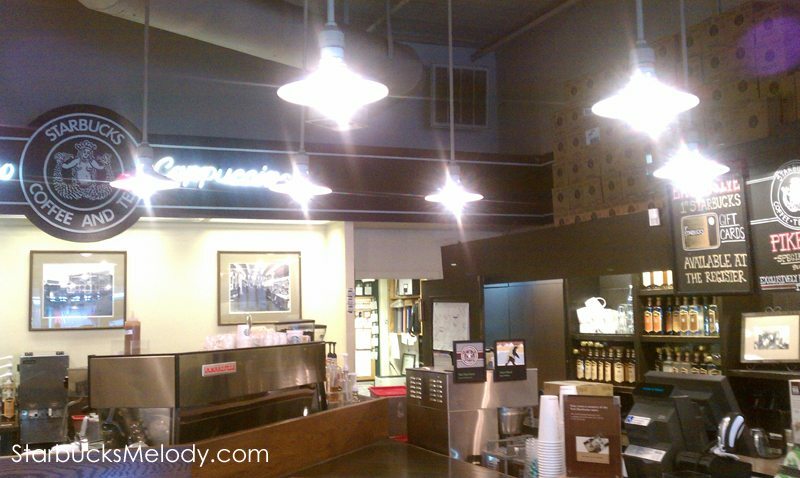 The lighting used at First and Pike is energy efficient, whereas the first store uses its historic lighting fixtures, which consumes more electricity than this store. 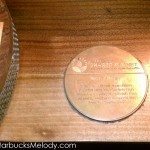 Notice that there is a plastic covering piece that says “Starbucks Fresh Roasted Coffee” on it. I wasn’t sure how to get a photo of the lights and get the words to show up. This was the best one I took, after randomly pressing a ton of buttons on my phone’s camera. More than two years after its opening, the store is still an extremely photogenic store. 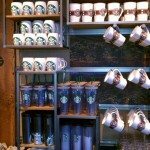 By the way, in the photos below you may notice that this store has some merchandise that is very unique, and otherwise is only available at the first Starbucks. 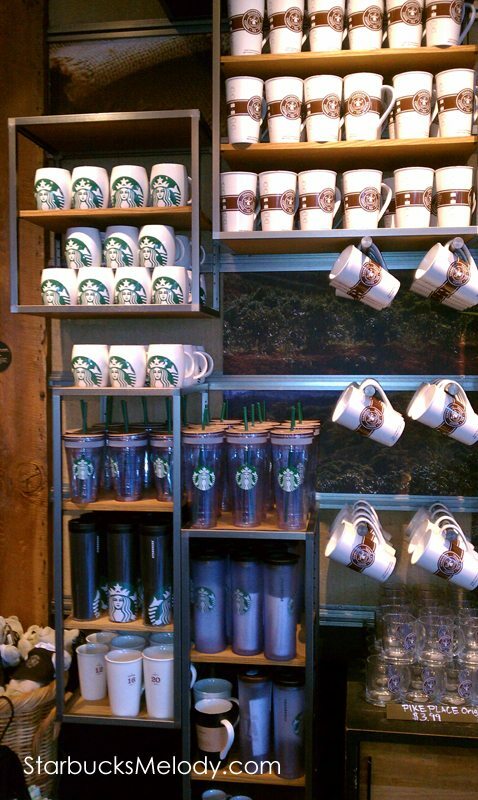 A few of the mugs are available only at this store as well as 1912 Pike Place, and this store offers the Pike Place Special Reserve coffee, available only at this store and 1912 Pike Place. I realize that I didn’t get a great photo of the store’s large community table. I wish I had taken a photo of that table the day the store opened. Etched in the community table is artwork describing the life cycle of a coffee bean. 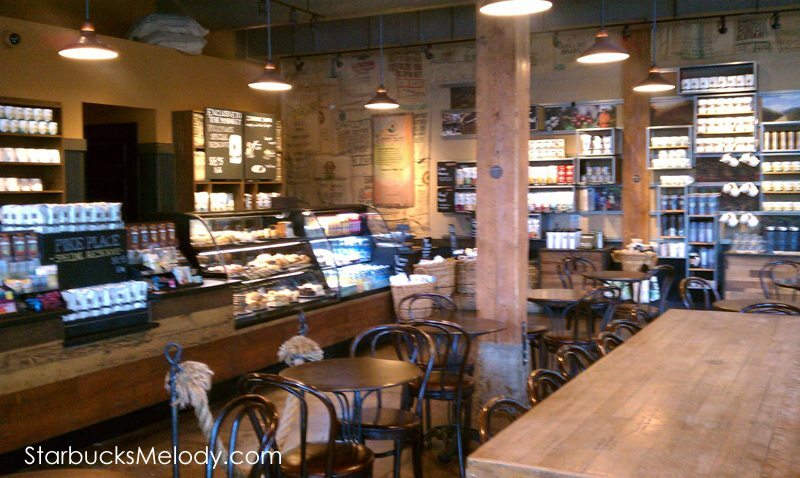 One of the store’s walls is decorated with burlap coffee sacks from the Kent Roasting Plant. 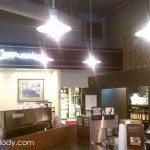 Throughout the store the beams, woodwork, and many fixtures are from fallen trees and repurposed materials. 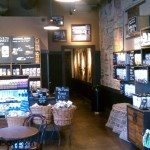 On one of the walls are historic photos of the first Starbucks. 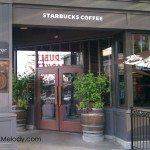 I featured some photos of this store in a March 8, 2011 blog article called “Starbucks CEO Howard Schultz rings the NASDAQ bell kicking off 40th anniversary festivities.” That’s still a fun post to look at and highly recommended. 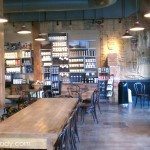 I hope you enjoyed a tour of this unique Starbucks! Feel free to comment below. 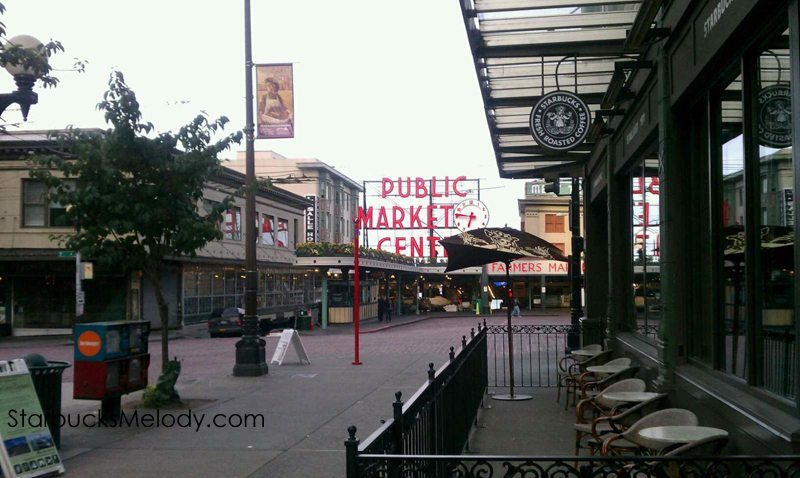 *Pike Street and Pike Place are two different streets in Seattle. Pike Place runs north-south, and is a small old, brick road inside the Market. Pike Street is a larger, busy street, and it runs east-west. 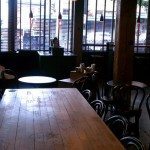 @James – Get there early in the morning! 😉 This store is busy all the time with tourists who are visiting the market. I love this store. I am a bit emotionally attached to it. I had the really palpatable excitement right before the day of the store opening. 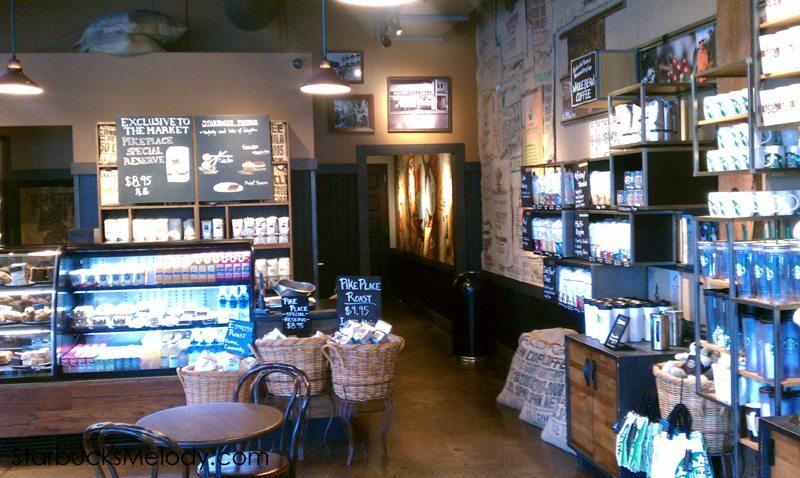 This store began a new era of store design for Starbucks. I didn’t know what was coming after that, but I couldn’t wait. 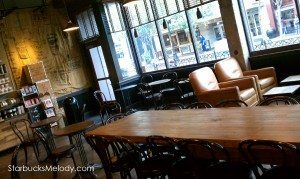 I walked in early the day it opened – Saw Howard and Cliff there – and I could just feel it was the beginning of a new era, like a new Starbucks chapter. 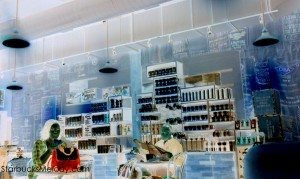 When Howard returned, we really saw a resurgence in changing store design to something far less cookie cutter. All that excitement of 2008 and 2009 was part of my daily life being right here in Seattle. And there are partners who have been at that store for a long time. It’s a great store. Sorry for the long reply to you. You can tell I really like this store. Melody I love all the pics especially the negative one you took. What a beautiful store! I just still cannot understand why this design theme is not being brought to a local store around here. Just yesterday I mentioned to the SM at my local SB about one of the pieces of artwork that needed attention and although he saw that it did not seem like he would do anything other than wait for a new poster to replace it. Felt sad that there did not seem to be any connection like what you say occurs with the SM by you. I do like the SM though, but there is a difference for sure. of course, another beautiful store! I especially like the beams. gorgeous. actually don’t care for the chairs so much. but, overall, beautiful! They are coming to New Jersey too Purple1! I promise. I’m sorry that it is slow to make it out to your neck of the woods. 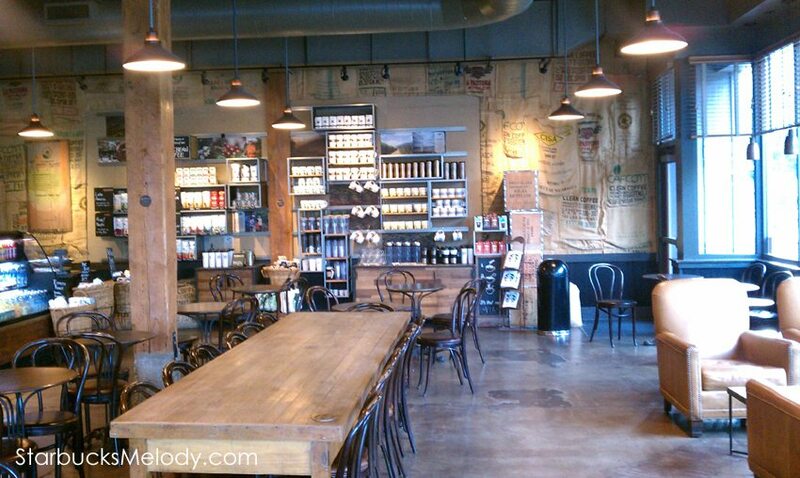 I promise not everything wonderful that Starbucks does is within a 2 mile radius of 2401 Utah Avenue South. @Denise – You crack me up. It got up to about 73 or 74 maybe even 75 yesterday and I thought I was going to melt. 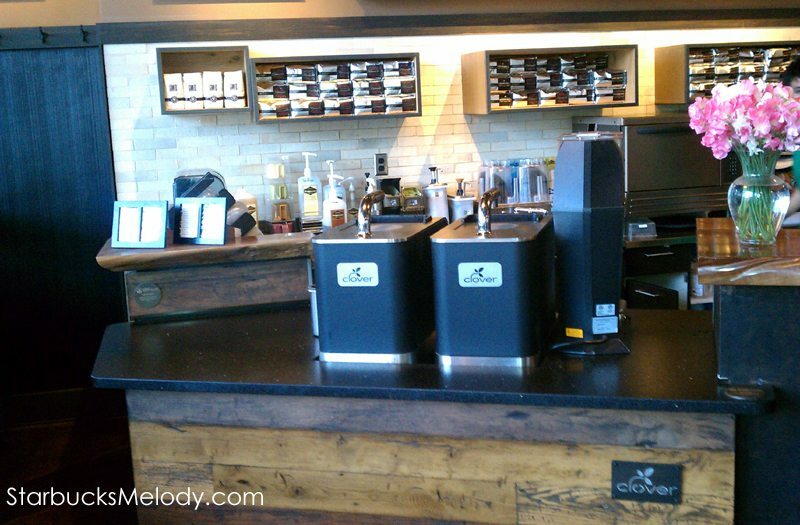 Yes, Clover Reserve coffees are supposed to be displayed horizontally. I’d never leave the house if I were you. A/c! Of course, in Seattle a/c is almost non existent from the ordinary person’s home. Looking at the outside of this store, I think it’s nice to be able to sit outside and have that glass canopy overhead protecting you from let’s say rain. There isn’t much room out there, but having something other than an umbrella overhead is nice. 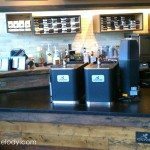 Since we are on topic of Clover stores….I’m also hoping to try the Jamaica Blue Mountain on a Clover this week. @Denise – This weather sux! 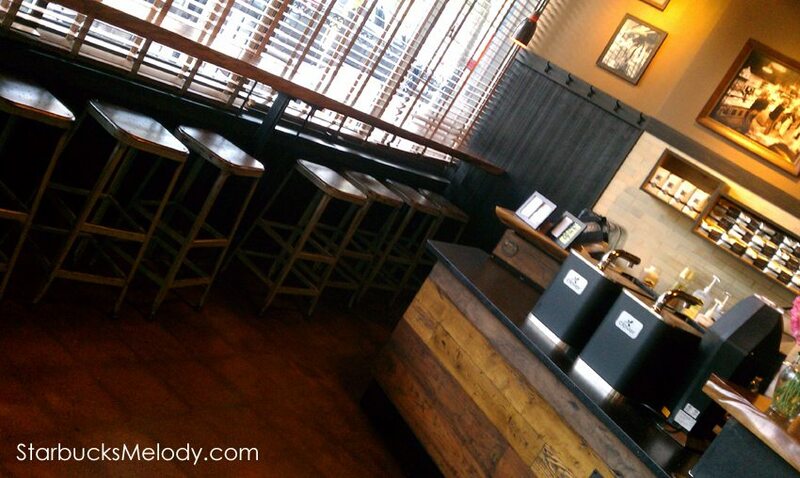 Hey – I ran into the DM at Harlem and Lake this afternoon and complained about all the French and Italian Roast. 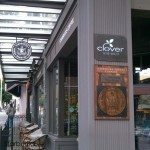 I also mentioned that that location would make for a great Clover Location. 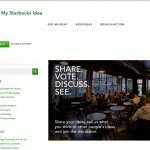 He agreed, as he has none in his District, and feels the same about the idea. 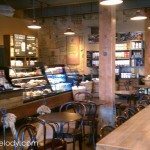 The drawback: His claim is that Starbucks will only do it on a remodel of a store and that store is too new. @Mel – 73° – 74°??? Sure… Rub it in! 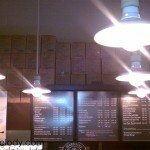 As to getting a Clover, I think I’ve heard it said that Starbucks wans to put a cap on the total of number Clover/ Reserve stores that there can be in order keep being able to source the smaller coffees. Don’t quote me on that. All I know is that there was a partner in Bellingham who made a comment something like “we had to fight to get a Clover.” It’s an uphill battle trying to persuade the SSC to give a store a Clover! Hey, we’re used to 50 to 55 degrees year round here in Seattle. (or at least for 10 months). I will take the Seattle weather all year round over Chicago’s weather anytime. I’m not sure I would be thrilled about the rain, but it doesn’t rain here anymore, it storms. As far as the are this store is located, I still like the idea of the glass canopy overhead minus the neighborhood. It’s funny…. Starbucks wouldn’t dream of opening up a store in some good areas of Chicago, let alone one in a shady area like this location. And this store supports a Clover in this area? Hmmm! Well…. I still enjoy all the pics and the stories Mel. As always, you do a great job. God Bless! @Chgo – This store is incredible mix of people coming through it. A few regulars possibly from the market (or other nearby places). A huge huge crowd of people (tourists) who are coming to and from the market. The foot traffic opportunity on that corner is huge. Possibly a few business people, but it’s not really a business-people type store like Key Tower, Smith Tower, or Columbia Tower. And a few homeless people. And a few rough types. 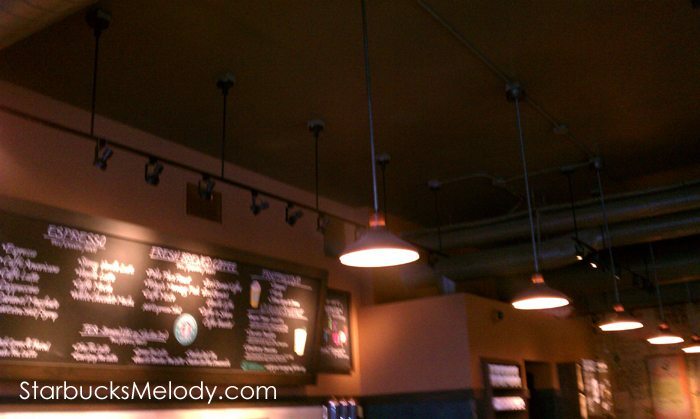 Melody – Thanks for sharing. Can’t wait to see it! I will definitely put it on my list of must see places. 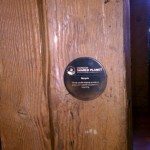 I visited this store not long after it opened (I think May 2009). 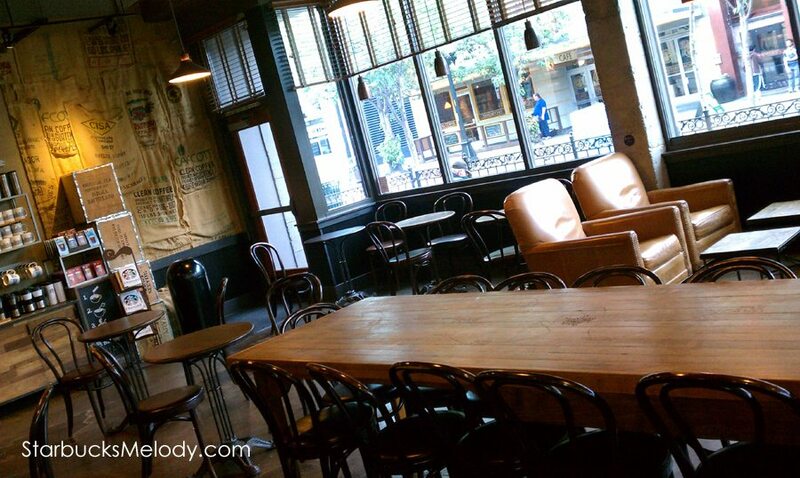 I especially like the communal table. 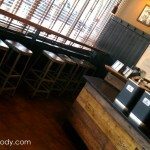 There’s a great cafe chain called Le Pain Quotidien that has them. Hubby is surprising me with a trip to Seattle for the weekend prior to our 25th Wedding Anniversary. 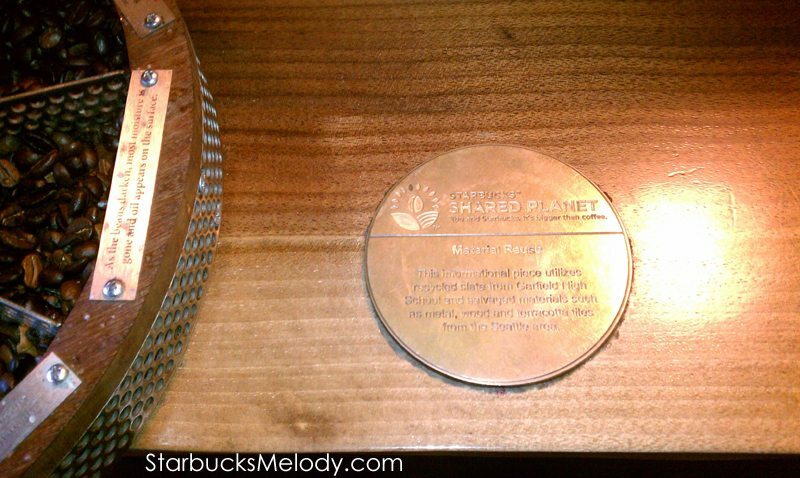 I have worked with Starubucks for over 5 yeaars and my main hot spot to see is Pike Starbucks. I’m and opener at my Indiana store so I;m looking forward to sitting outside waiting for them to open. 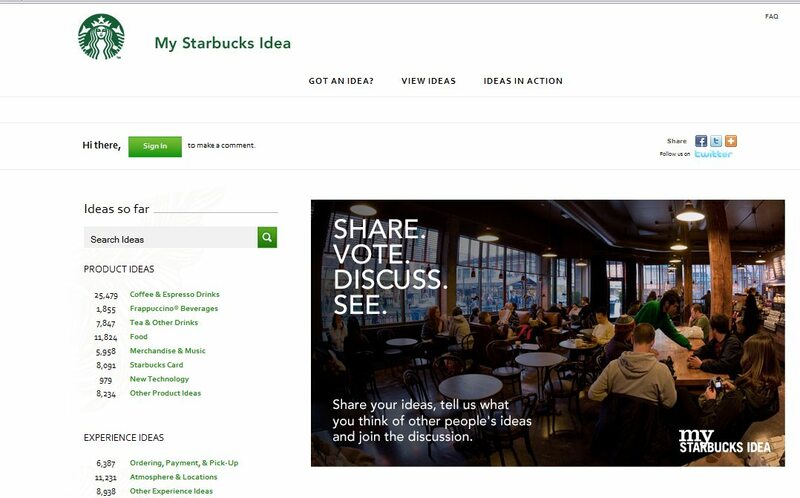 I heard partners could visit the Starbucks Support Center. Anyone know that to be true or have any info?? ?